I have two DT cards this time for our fortnights challenge #144. at Creative Fingers. The first card has two lovely little kittens who are the bestest of friends! The supercute motifs are from our sponsor Maria Medel Illustrations. She has shared a fantastic discount code with us, a 30% discount coupon with the code CHALLENGE18, valid from March 15th. to May 15th. AND, if you sign up for her newsletter, you'll get a 15% off forever! Stensiler er kjempeflotte verktøy, billig i bruk og passer stort sett alle overflater! Stamps/Images: Maria Medel Illustr. on etsy 'Kitties digital stamp bundle', and 'Valentine Monkey set'. 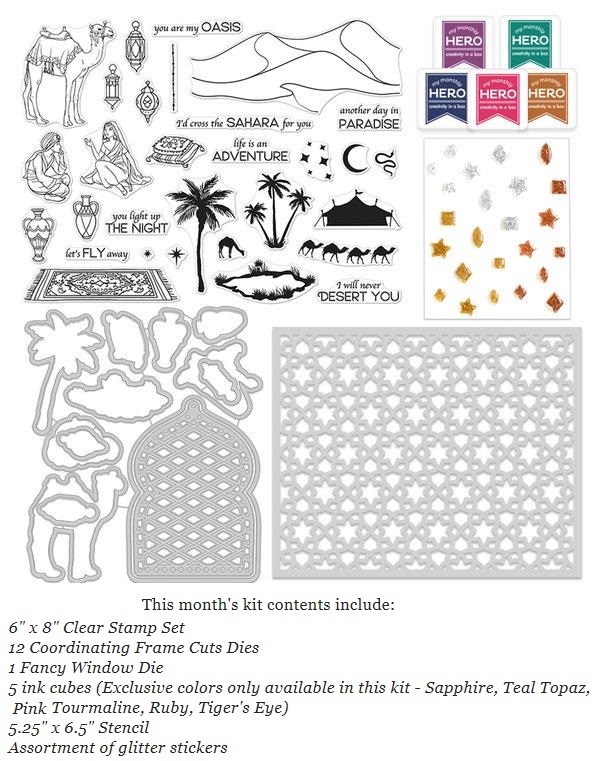 My monthly Hero Arts kit MH0318 stamps and co-ordinating dies. Papirdesign Clearstamps 'Glad du er min venn'. Kort & Godt 'M-321'. Norsk Stempelblad Ett trykk 'CS A04 Venn'. Papers: I prefer Canson Montvale aquarelle paper (200 g/m coldpressed) for my motifs. Bazzill cardstock. Plain white cardstock. Making Memories spiral bound journaling paper. DoCrafts 'Pampered Pets' 12x12 paperpack. Panduro Hobby 'Circus' 12x12 pp. Embellishments: ... none, yes really! Tools: I always use my Scor-Pal to score n fold my cards. My distress tools from Ranger Ink is always in use ~ Tim Holtz® Mini Ink Round Blending Tool & the Inkssentials Ink Blending Tool and Foams. EK Success® Whale Of A Punch 'Large Circle 1.75' & 'Inverted Corner Punch'. Marvy Uchida punch 'corner rounder small 1'. Stencils: Joanna Sheen Signature coll. ~ African Stencils 'Mount Kilimanjaro 6625', and 'African Safari 6626'. Hunkydory ~ For the Love of Masks 'Go Wild'. Dies: Spellbinders™ Nestabilities Nestabilities 'Labels 4 S4190', 'Petite Ovals Large', Deckled Edge Classic Ovals Large'. Speech bubble, banner dies and 'Hugs' fancy die from the same Hero Arts kit MH0318. Essentials/Adhesives: Double sided tape. 3D foam/mosegummi. High-Tack Double Sided Red Tape (Red Liner/Stix2/Miracle tape). Rangers Glossy accents. Techniques/Mediums: I used misc. Luminarte Twinkling H2o's Shimmering Watercolors, and Tim Holtz Distress Ink pads & markers, plus Oxide inkpads, to watercolor and distress image and papers. misc. Hero Arts, Ranger archivals, Prima chalk ink pads. Igjen har jeg funnet frem Hero Arts sitt klubb nydelige klubbkit med '1001 natt' tema dies og stempler fra desember ifjor, denne gang sammen med et par av mine absolutt eldste stempler ~ All Night Media øyenstikkeren må vel være rundt 20 år gammelt for det var allerede et godt brukt stempel da jeg kjøpte det for mer enn ti år siden, og både Lazar StudioWerx snirkel stemplet og Whiff of Joy jenta inni er fra stempelsett jeg kjøpte i 2010! Stamps/Images: Hero Arts MMH December 2017 Kit stamps & co-ordinating dies. All Night Media 'Dragonfly'. The Elisabeth Bell rubberstamp girl inside the card, is from the Whiff of Joy 'WOJ April 2010 kit - Scheherazade 1001 Nights'. Creative Stamping magazine issue #42. 'the Enchantment collection' stamp set. Lazar StudioWERX Inc rubberstamp 'Funky Holidays' (swirl). Digital circle journalingframe from Createwings Designs 'Tiny Treasure kit'. Papers: I prefer Canson Montvale aquarelle paper (200 g/m coldpressed) for my motifs. Bazzill cardstock. Plain white cardstock. Prima marketing inc. 'Reflections' Designerpapers 6x6 paperstack. Embellishments: Galerie & Europris rhinestone embellies. Notabene gold glitter gavebånd/paper ribbon. Dies: Fancy window die from the december Hero Arts kit. Spellbinders™ Nestabilities 'Grand Labels One LF-161'. Sizzix Bigz Tim Holtz Die w Texture Fades embossingfolder 'Layered Butterfly'. Creative Expressions - Sue Wilson Finishing Touches 'Wispy Fronds dies'. Apple Blossom Floral Frames Collection 'Rose Butterfly' die set. Essentials/Adhesives: Gluedots. Scor-Pal Scor-Tape Double Side Adhesive tape 5inch x 27yd (HUGE! great value bought on Blitsy). 3D foam/mosegummi. High-Tack Double Sided Red Tape (Red Liner/Stix2/Miracle tape). Rangers Glossy accents. Misc. Ranger Stickles & Tonic Nuvo drops. Techniques/Mediums: I used misc. Tim Holtz Distress Ink pads & markers to watercolor and distress image and papers. To heat emboss sentiment & the big butterfly I used a Versamark inkpad, a heat gun tool and 'Aladine poudre à embosser OR gold' plus a white Hero Arts embossingpowder. The background behind the fancy frame die is made with a really tacky sheet of tape behind, then rubbing some yummy Indigoblu Megaflake Chocolate Box gildingflakes on the panel. A hanging shaker easter greeting tag / card is my DT inspiration for PapirPlaneten, wich has an Easter theme challenge for March. One of my absolute favourite tools ~ the SilentSetter from ProvoCraft. Super easy to make holes with, or to add eyelets! Stamps/Images: Magnolia rubberstamps 'Lille Skutt', and 'Påskeegg med tag'. Papers: I prefer Canson Montvale aquarelle paper (200 g/m coldpressed) for my motifs. Bazzill cardstock. Plain white cardstock. Plaid 'Spring casual' 12x12 paperpad vellum. Embellishments: Panduro Hobby Ribbons 'Garden Vintage' green lace, 'Paradise' ric-rac/kroklisse, 'Ethnic Blue' flower. Multicraft 'Baby' craft medley cup sequins. Sense white sticker border. Tools: My distress tools from Ranger Ink is always in use ~ Tim Holtz® Mini Ink Round Blending Tool & the Inkssentials Ink Blending Tool and Foams. ProvoCraft Silent Setter tool. 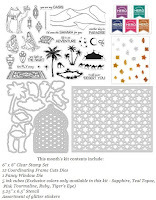 Sizzix Textured impressions embossing folder '658300' from the Big Shot starter kit. Dies: Spellbinders™ Frameabilities 'Polka Dot Frame'. QuicKutz (new branded as LifeStyle crafts/WRMK) 'Kylling / Chick KS-0411', and 'Cracked Egg Club Die QC-011-S'. Hero Arts 'Spoken Bird' February 2018 club kit egg and nest dies. GummiApan 'God Påske die D170710' (=Happy easter). Essentials/Adhesives: Gluedots. Double sided tape. 3D foam/mosegummi. High-Tack Double Sided Red Tape (Red Liner/Woodware/Miracle tape). Rangers Glossy accents. EK success anti-static powder tool. Uniball Signo white pigment ink pen. Techniques/Mediums: I used misc. Tim Holtz Distress Ink pads, Oxides and Distress Spray stains to watercolor and distress image and papers. [Oxides Colorcombo: Broken China, Foss.Amber, Cr.Pistachio]. Mica + water spray.